From employee hours to equipment service tracking, store owners can track every aspect of the Laundromat business. Card Concepts Inc. manufactures and develops automated systems for the self service laundry industry. LaundryCard™ was developed to act as a backbone to the Totally Automated Store (TAS) concept. LaundryCard is a coin replacement system for Coin-Operated Laundromats. 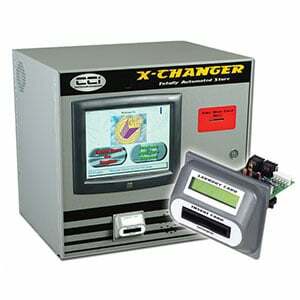 In a LaundryCard store, all of the laundry equipment is outfitted with card readers and kiosks (called X-Changers). These are installed and dispense Loyalty Cards that customers can add value to and start machines. The system maintains the customers card balance and allows them to revalue their card with either cash or a credit card. This enables the store owner to take advantage of float, or money on a customer’s card that has yet to be spent. It’s a complete management system tracking every aspect of the Laundromat business – from employee hours to equipment service tracking. Store owners can manage their store from any Internet connected PC. All of our technologies are designed to be easy to use, easy to implement, and easy to support.